Faz is the rarest of rare animals: a musical drummer. ‘How is this possible?’ I hear you ask, and the answer is simple: he’s not your archetypal stupid drummer. In fact he’s as sharp as a tack (for a drummer). Faz makes it all look very easy and blends perfectly with Steve to make the best rhythm section for miles around. He never overplays (always a temptation for a drummer) but never misses a beat. Faz makes it all look easy. Faz started drumming, as so many do, in the Church Lads Brigade. From there it was a logical and easy step to get a full kit and start playing the tunes of the day. 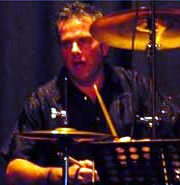 Faz has played in bands most of his adult life covering musical genres from 60’s pop to heavy rock. 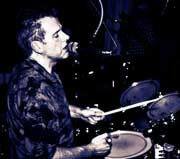 Recently Faz played drums on a single that was released for a local charity.